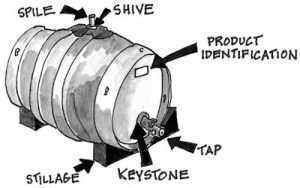 A Firkin is a unit of measurement, and also the size of a particular kind of keg for cask conditioning. One quartre of a barrel, 72 pints, 9 imperial gallons…blah, blah, blah. The bottom line, the brass tacks, the nitty-gritty…or, if you will, the bottom of the glass…it is a specialty beer that is tapped in a unique way. A firkin is a “Real Ale” in that it has not been cold filtered, pasteurized, carbonated, or screwed up by any other source. You will be drinking a free range, cage free beer, just like those back in the first days of beer drinking. So a firkin is a time machine to take you back to time when men were men, the west was wild, beards were not manicured, and beer was actually beer.